Contemporary one-act plays directed by Edgewood Theatre Arts Students: fresh, funny, thought-provoking and smart, this variety pack of plays showcases the talents of our students on stage and behind the scenes. 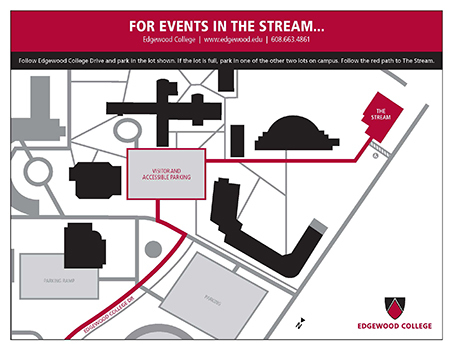 Check out the maps to the right if you need directions around campus. 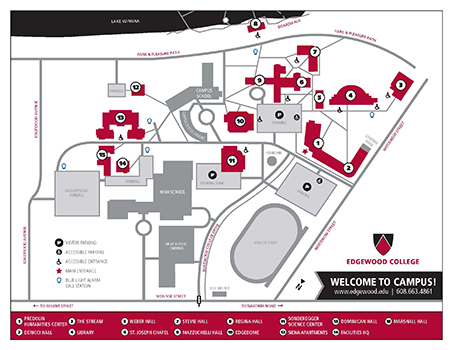 Edgewood College Theatre presents an annual season of productions for the students, the college community and the greater community of Madison. We rotate our offerings to provide a wide range of theatrical experiences, time periods, genres, voices and lenses for both our students and our audiences. These productions create an educational and artistic environment that nurtures creativity, academic integrity and professionalism. The productions also serve as the context in which classroom and studio work combine with performance as we collaboratively share our vision and ideas with the community, our audiences. We strive to give students hands on opportunities to learn theatre by doing theatre--both onstage and behind the scenes, to practice green theatre techniques by leaving a light footprint on the earth, to serve the students we have at the highest level while always seeking to enrich the diversity of our talent pool, artists and theatrical offerings, and to uphold the Sinsinawa Dominican values and mission to serve. Are you a patron of Theatre Arts? Check out Footlights, a regional guide to Theatre productions across the country. Keep an eye out for our own productions being highlighted on the site.